Exclusive presenting recognition (“Your Company Presents A Toast Among Ghosts"). Booth space (with two six-foot tables and canopy) at the event or company banner. Stage sponsorship with logo signage and company mentions from stage. Acknowledgment in dateLines, Baltimore County Public Library’s quarterly printed calendar of events and newsletter. Four (4) tickets to the event. Presenting sponsor (with logo) on the library website. Logo on Foundation website for at least one (1) year. Name (with link and logo) listed as presenting sponsor on Foundation website. Recognition in Be All In, Baltimore County Public Library’s monthly electronic newsletter distributed to over 200,000 people via email, and Foundation Focus, the Foundation's newsletter to 2,800 people via email. Name and logo on any promotional material (i.e. press releases, digital monitors seen in branch, posters, etc.). Naming rights for two (2) Bars, Ghost Story Fire Pit, Puppet Show, Cemetery Tour OR Local History Display. One bar has been claimed. Two six-foot tables at the event or company banner at event. Three (3) tickets to the event. Name (with link) listed as sponsor on Foundation website. Logo on Foundation website for at least three (3) months. Name on any promotional material (i.e. press releases, digital monitors seen in branch, posters, etc.). One six-foot table at the event or company banner at event. Two (2) tickets to the event. Name listed as sponsor on Foundation website. 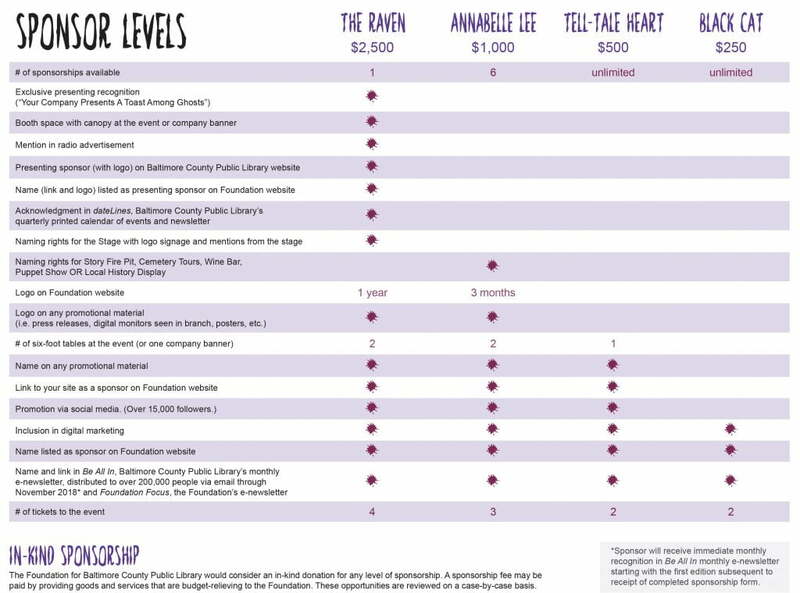 The Foundation for Baltimore County Public Library would consider an in-kind donation for any level of sponsorship. A sponsorship fee may be paid by providing goods and services that are budget-relieving to the Foundation. These opportunities are reviewed on a case by case basis. Sponsor A Toast Among Ghosts today using the secure online form at the link below or download a fillable PDF form.